'Tis the season of Love. The season when men on bended knees propose for marriage, flowers are so in demand that their prices triple and love hotels (a.k.a mot mot, aling vicky, ssshhh) get full from sun up to sun down. Tell you something: I seldom get flowers on Valentines.The Hubby is not the type who sends flowers, and I've ceased asking whatever his reasons are. To be precise, he has given me flowers only twice in our 16 years of being together (from the time we were dating 'til we got married and have children). The first time was when we were in college during our first Valentines Day together. I thought it's going to be an annual flower delivery but to my dismay, it will be 14 years before another bouquet will be sent my way. It was Valentines 2009, The Hubby must have eaten something sprinkled with love potion and bought me flowers. Imagine how thrilled, happy and beautiful I felt when, after having our dinner, I opened the car door and there on the passenger seat were pink roses and a small teddy. If we were characters in a movie that moment, I would have wrapped my arms around his neck and kissed him passionately. Cut! We were not, aren't you glad? Haha. 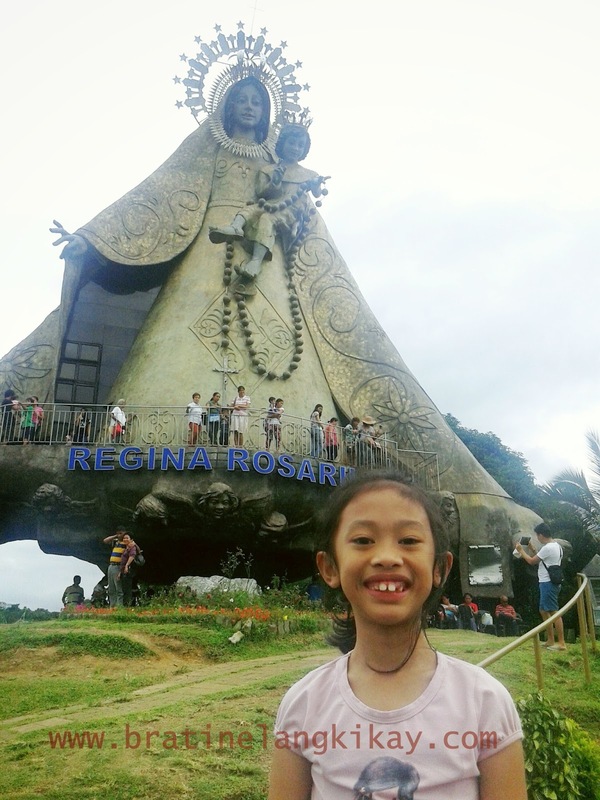 Instead, before I could even say 'Thank you', a small voice at the backseat asked "Where's my gift too, Daddy?". 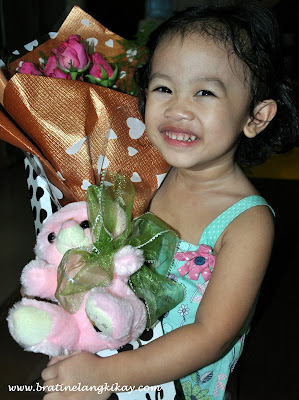 That was Eone, asking for her own bouquet as we were driving towards home. I thought we can explain why she was not gifted with roses and offered she can have the teddy bear instead. Upon reaching home, Eone demanded I hand over to her her flowers and started crying when I refused (nicely - saying "Baby, when you grow up you will have a lot of flowers too"). Seeing no end to the drama and like a child refusing to let go of a doll, I reluctantly bequeathed to her my bouquet of roses. The very first bouquet of flowers The Hubby gave me since we got married was taken from me against my will by another girl. Luckily, it was my daughter. That Valentine was the very first in 14 years that I've been given flowers and I had it to myself only for 14 minutes. she even had her picture taken with MY flowers! May your Valentines be colorful like mine. Happy Valentines! Awwwww.. your little girl's a darling! Onga naman.. bakit wala siyang sariling bouquet at teddy bear? :) Anyhow, my beau is also the same.. minsan lang magbigay ng bulaklak (in all our 6 years). But whenever he does, nakakakilig lang. :) Happy Vday (tomorrow)! It really felt funny that a bouquet of flowers you've waited 14 years lasted only 14 minutes. You have a tough daughter who's so smart to demand she gets the flowers. That is life... I have experienced with that similar situation Someone or somebody has received my token given to my wife Though I am quite disturbed or embarrassed more so felt insulted but I have to admit it.